♦ For rigid bodies centre of mass is independent of the state of the body i.e. whether it is at rest or in accelerated motion centre of mass will remain same. Similarly, we can write the expression for Ycm and Zcm. Choosing O as the origin of the coordinate axis. If no external force is acting, whatever may be the internal changes in the system, (a) the centre of mass remains at rest if it had been at rest before internal changes took place, (b) it continues to move with a constant velocity in a straight line if it had uniform motion before internal changes and (c) if an external force is acting on the body before internal changes took place, it will continue and move in the same trajectory and with the same variation in velocity after the change takes place also. ♦ The position of the centre of mass of a body depends on the shape, size and distribution of mass of a body. The centre of mass does not lie necessarily at the centre of the body. Many objects have a point, a line or a plane of symmetry. The centre of mass such an object then lies at that point, on that line or in that plane. ♦ The centre of mass of an object need not lie within the object. For a horse shoe or an iron ring, for example, there is no iron at the centre of mass. 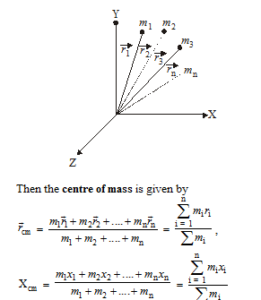 ♦ In symmetrical bodies in which the distribution of mass is homogeneous, the centre of mass coincides with the centre of symmetry or geometrical centre. ♦ The centre of mass changes its position in the translatory motion but remains unchanged in rotatory motion. ♦ A rigid body is any system of particles in which the particles remain fixed in position with respect to one another. ♦ No real body is perfectly rigid. However, in solid bodies, the relative displacement by the external force is so small that it can be neglected. ♦ The property of a body by virtue of which it opposes any change in its state of rotation about an axis is known as moment of inertia. ♦ The moment of inertia of a rigid body about a given axis is the sum of the products of the masses of its constituent particles and the square of their respective distances from the axis of rotation.